Excite your loved ones and friends by giving them one of these super cute crocheted little hearts for Valentines Day. 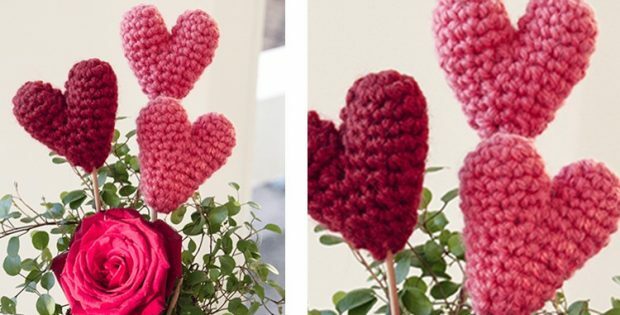 Actually, these cute crocheted hearts are an ideal project for beginner level crocheters. Once completed, the hearts should measure approx. 3 inches in width and 3.5 inches in length. In metric measurements, the finished crocheted little pretty hearts should be about 6.5 cm wide and 7 cm long. Drops Design’s amazing creative designers are the people responsible for these crocheted little hearts. In fact, you can access the FREE downloadable crochet pattern for these cute crocheted hearts from Drops Design. To access the FREE downloadable crochet pattern for these tiny hearts, please click here: Super Cute Crocheted Little Hearts. Featured image(s): Drops Design, thank you!